While one-time expenses and a struggling external market put additional pressure on credit union bottom lines, it may be that time is one of the most important sources of credit union capital. In our most recent issue of CUSP, the statewide performance of credit unions in California and Texas were compared. Today I wanted to re-visit one side of that topic with a look at credit unions in California through the third quarter of 2009. The data included in this article comes from Callahan's FirstLook program, which presents third quarter data for credit unions representing 95% of the industry's total assets. Let's get the bad news out of the way first. California, like the rest of the so-called "sand states," has continued to struggle. As you have read in numerous headlines, credit unions in California are posting a net loss on a year-to-date basis, have rising delinquency, and saw capital levels decline. However, while these points may make headlines, they also ignore one of the core strengths of the credit union model. So what does "Time Heals All Wounds" have to do with credit union capital? 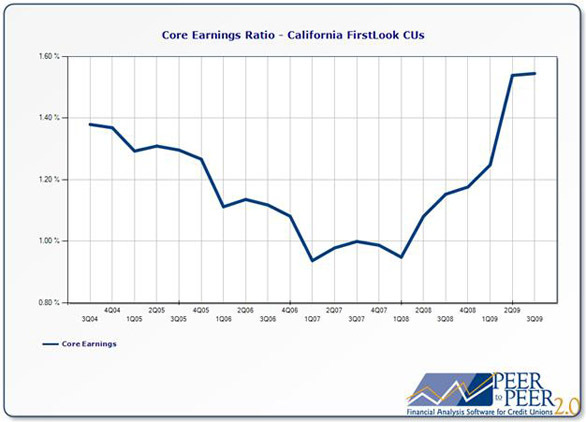 Through September, credit unions in California reported a core earnings ratio of 1.54%. With assets of approximately $114.3 billion dollars, this means that credit unions in California are on pace to earn approximately $1.8 billion dollars from operations in 2009, or $4.8 million dollars per day. So, while one-time expenses like the NCUSIF premium and corporate capital write-offs reduce capital levels, credit unions are rebuilding their capital the old fashioned way, one day at a time. Over time, earning assets will offset these one-off expenses. In addition to one-time charges, declining asset quality can result in charge-offs that reduce credit union capital. Through September credit unions in California reported an average delinquency ratio of 2.19%, and an annualized charge-off ratio of 1.86%. While both of these ratios are up from the levels reported in June, that rate of increase has slowed substantially. But while delinquencies rates are rising, credit unions in California have increased their provision expense by 83% over the past 12 months, more than doubling their allowance for loan losses. 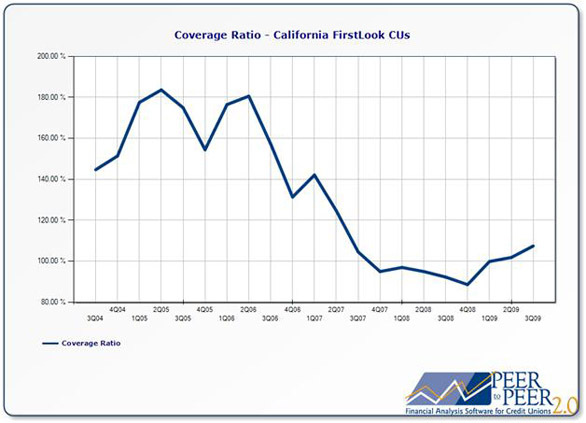 This means that even with rising delinquency rates, the coverage ratio for credit unions in California has actually increased during that same period, back on the rise to 107.4% through September. With a coverage ratio over 100% and stable core earnings, credit unions in California are positioned to work through the financial difficulties currently plaguing their state. By continuing to meet the needs of their members credit unions in California will see their capital restored to its previous levels, it just takes a little time. For more information on September 2009 performance, visit our FirstLook page. Users of our Peer-to-Peer and CUAnalyzer software products already have access to this data free of charge and can begin their analysis today. Instructions for importing this data into Peer and CUAnalyzer can be found here.